"How long did it take to paint this?" This is the most common question I hear. Painting whole life cycle of a plant means at least 1 year, when I am lucky. Very often longer than that. Then another question comes. "Does it worth that much time?" Of course, yes! No good artworks have been created in a day. Many artists in history struggled for many years with one painting. One last question still comes. "Why don't you just take a photo?" You cannot capture four seasons in one photo. You would say, yes you can with computer manipulation. But that is a totally different story. 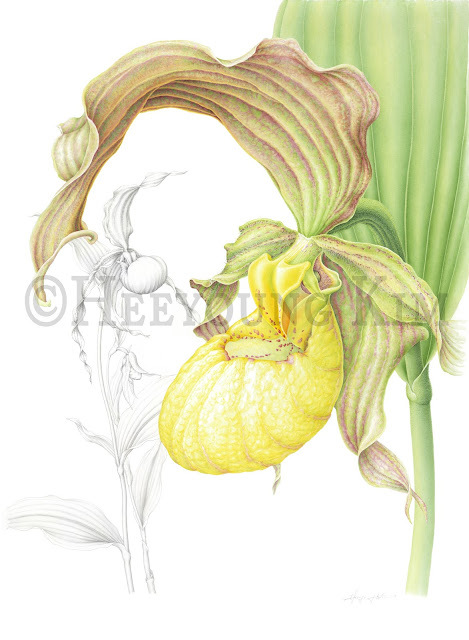 A botanical artist can create an artwork that transcends time and space, and that combines art and science. Plant resources are decreasing from many reasons. This one painting could be the only or one of a few visual materials that would prove its existence to our next generations. Don't you think it is worth my time?